Workers of a garments factory in the Cavite ecozone voted yesterday to go on strike in response to the mass termination of 16 union officers. The law provides a seven-day notification period before any actual work stoppage can be launched by workers of Dong Seung Inc. The National Conciliation and Mediation Board have called for a conciliation meeting between the company and the union on Monday. 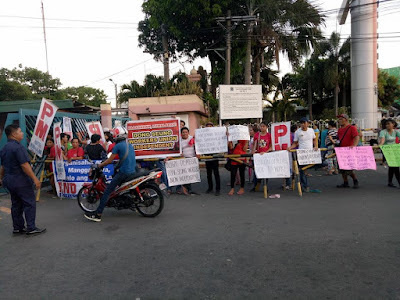 Yesterday scores of Dong Seung workers and their supporters trooped to the Cavite ecozone main gate to protest the union busting and call for respect for freedom of association. The rally followed a forum in which Cavite ecozone workers aired their grievances about low pay, insecure jobs, verbal harassment and excessive work quotas. The Dong Seung union officers were served notices of termination in their houses by an HR officer of the company last April 12. They were supposed to back to work on April 13 as part of the agreement. An earlier strike notice was precipitated by the one-month suspension of the 16 union officers. “The firing of all 16 union officers, including the union president, is just the latest in a series of union busting moves by management. Moreover it is a maneuver done in bad faith as the union just withdrew a notice of strike earlier filed. The retraction of the strike was part of an agreement mediated by the Labor Department wherein workers will be accepted back to work after an investigation by management,” explained Juanito Diaz, president of the Dong Seung Workers Union-Independent. Dong Seung Inc. is a Korean-owned apparel manufacturer inside the Cavite Economic Zone, the country’s biggest government-run export processing estate. It manufactures garments for global brands Macy’s and Ann Taylor. Dong Seung workers are asking Macy’s and Ann Taylor to remediate the code of conduct violations of its supplier. The union had filed a petition for certification elections in the company last December. Immediately after, the union alleged that management started harassing officers and members. Unionists were denied loans or were forced to withdraw support for the union in return for access to loans. Union leaders were transferred to different production lines and a union officer was demoted from mechanic to sewer. Then in the latter part of March, management suspended for 30 days all union officers on the pretext that they smeared the company by seeking action from the factory customers regarding violations of freedom of association and labor standards.